The crockpot is an underrated kitchen appliance. But in my own home, it's one of the best cooking tools for several reasons. Most importantly for me, it allows to create delicious meals with low effort and for a low price. Few dog owners realize that it can work absolutely wonders for homemade dog food as well, so I decided to present you with some great homemade crockpot dog food recipes and a few tips. A year ago I switched mostly to making homemade crockpot dog food and it's been a huge relief on my time and my finances. These are the two biggest complaints dog owners have when attempting to make meals for their pets: “Who has the time?” and “Who has the money?” I have a busy household and we live on a budget, so this was definitely true for me. With slow cooker dog food cooking, all you need is a few minutes to toss all the ingredients and let it cook for a few hours until it's done. 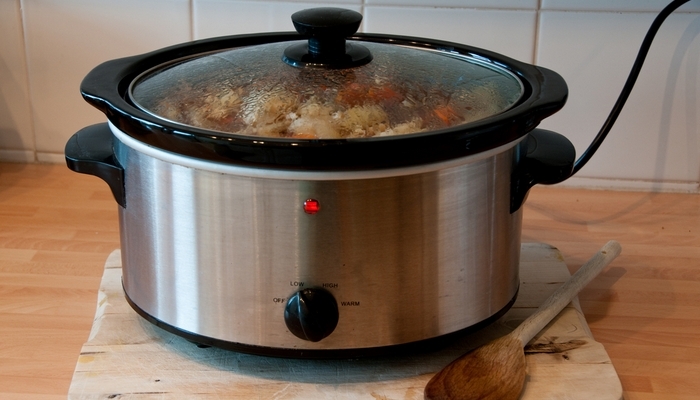 My dogs and any other pet owner I know love any meals that come out of a slow cooker, too. I would only advise that you consult with a veterinarian about the below (or any other) homemade crockpot dog food recipes you're going to try. You may need to include specific ingredients or some dog supplements so it's balanced. I started using parts of these meals as dog treats and also stuffing my dogs' toys with small bits. It's easy to store all this food in a fridge or freezer for later feeding using a simple Tupperware or a dog food container. I usually cook about 2 weeks' worth of meals for my dogs, and it's all done by the time I get home from work. You can keep most slow cooker dog food meals in an airtight container in the fridge for 3-5 days, and for up to 8-10 weeks in a freezer. This is the most basic, small size ceramic and stainless steel slow cooker, but it gets the job done perfectly well. 3 quart capacity is enough to make a large serving that you can split into about a week's worth of meals for your pet. It has the only three settings you need: high, low and warm. Dishwasher safe. Nothing else is really needed. It's also the cheapest and best rated on Amazon. For something a little bigger (or rather standard slow cooker) you can't beat this option in price and quality. 6 quart capacity is the norm and it's plenty for making about two week's worth of crockpot dog food. This one is also a little more powerful and has some extra features, like temperature control, defrosting, LCD screen and more. Personally, this is my favorite one, and it's absolutely worth the extra ten dollars. 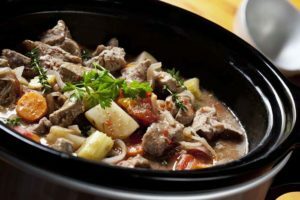 There are several more great slow cookers that you can buy and they will have more features (and will be more expensive), but personally I don't see the reason for spending extra, particularly when using it with homemade crockpot dog food recipes. With that in mind, for anybody looking to try it, I highly recommend it. Samantha has also previously posted several homemade crockpot dog food recipes with a step-by-step video (see here: one, two, three, four), so take a look at those for the exact process and valuable tips on how to use a slow cooker for dog meals. For homemade crockpot dog food serving sizes, see her article and video right here. Below are five of my favorite homemade crockpot dog food recipes you can try with your own pets too. Stir the ground beef, brown rice, butternut squash and brown rice into a standard six-quart slow cooker. Add the carrots, the peas and four cups of water into it as well. Once everything is well mixed, cover the crockpot and cook the meal at low heat for about 6 hours. Alternatively, you can cook at high heat for 2 or 3 hours, but you’ll need to stir regularly. Once the stew is ready, let it cool off completely. After that, it will be ready to serve or be put in the freezer. Side note: Some owners may be worried that this homemade crockpot dog food recipe is not suitable for the pooch as some cuts of beef can be fatty. This is a valid concern for a lot of dogs that are prone to becoming overweight or otherwise need to stay on a low fat diet. If that's the case, you’d do well to opt for lean beef to lower the amount of fat in the meal. Alternatively, you can also swap the beef altogether and replace it with chicken or with ground turkey. The latter two options will change the entire taste of the meal but your Fido is likely to enjoy it just as much. 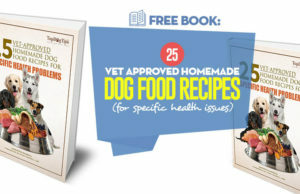 After consulting with a vet about homemade crockpot dog food recipes and if given a green light, remember to ask about supplements to use with this or other recipes recipes to make well-balanced meals. Meat Feast slow cooker dog food meal ingredients. This is Samantha's recipe from here, and it's a very simple one to make. It takes about 10 to 20 minutes to dice the veggies and fruits, which is the only time-consuming task. When sliced and ready, put all your ingredients into the crock pot and stir the food occasionally as it cooks. You can cook for four hours on a high setting and seven hours on a low setting. With this slow cooker dog food recipe, you can easily substitute the ingredients that your Fido enjoys more or for health reasons (based on what your vet tells you). 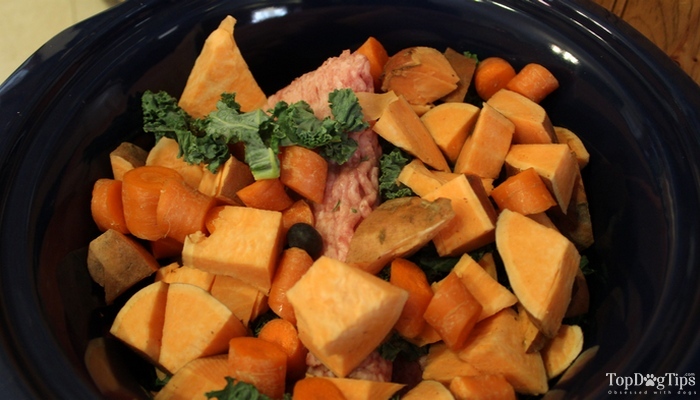 You can use frozen meat in this slow cooker dog food recipe. It will save you the time of defrosting the meat, and it won’t change the taste or texture of the food at all (trust me, the dogs will still enjoy it). All you have to change is add about 30 to 45 extra minutes to the cooking time to account for the frozen meat. Once the beef and pork are done, you can feed it to your pooch after it cools off. Store the rest in an airtight container in the refrigerator for 3-5 days, or you can freeze it. Put the chicken thighs into the slow cooker. Add chicken livers, carrots, beans, apples, and water to it. The water needs to be just enough to cover the rest of the ingredients and not more. Cover the pot and cook on low heat for 8 hours (or on higher heat for 2-3 hours, but you’ll need to stir frequently; this depends on your slow cooker, too). 10 – 15 minutes before the meal is cooked, add the peas, parsley and olive oil. Once everything is cooked, let it cool off completely. After that, it’s ready to serve or be put in the freezer. Side note: Remember that while apples are good for dogs, apple seeds are toxic, so it is crucial to remove the core and the seeds from the apple(s). This generally applies to all fruits and vegetables. Also, to prevent choking with any of these homemade crockpot dog food recipes, you are strongly advised to remove the bones from the thighs (or to remove deboned chicken altogether). The ground turkey and the chicken thighs are to be placed first in the crockpot. Pour just enough water to cover them completely. After that, add the rest of the ingredients and cover the slow cooker. Cook your slow cooker dog food meal like this on a low heat for 12 hours. I do not recommended to cook on a higher heat because it will require constant stirring and it will still take several hours. Once the crockpot dog food meal is ready, let it cool off. Remove the bones from the chicken in order to prevent choking (before or after). Once that’s done, the dish is ready to be served or to be frozen in portions for later use. Once again, remember that if you're not using any commercial dog foods then ask your veterinarian about this specific recipe and any supplements you must add. Layer all the ingredients in a crockpot in the above listed order. Chicken breasts should be on top. Cover all of them with water and start cooking. On a low heat around 8 hours should be enough. With higher heat, you can cook for just 5 hours or possibly even less, but with frequent stirring. Once your slow cooker dog food meal is cooked, mix and stir the ingredients once again. Break the chicken into small pieces and make sure that everything is soft. After that, let the dish cool off completely and it will be ready to serve or to be put in the freezer for later us. Side note: You can substitute some of the ingredients (see Samantha's article/video for homemade dog food substitutions explanation). Broccoli florets, zucchini, spinach or squash can all work quite well in this slow cooker dog food recipe. You can also swap the chicken breasts with turkey, beef or lamb, but be careful not to increase the fat content of the dish too much. As with all above mentioned homemade crockpot dog food recipes, remember to add the vitamins, minerals and calcium supplements recommended by your veterinarian if you plan on making this dish a major part of your dog’s diet. Otherwise, mix with commercial dog food for a well-balanced diet.